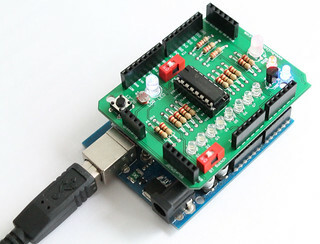 This experiment with Amarino shield is similar to our previous tutorials on Sensor Graph- basic experiment and Sensor graph & LED controller together. In this experiment, the sensor signal from LDR is fed to A1. You can also see A1 clearly on PCB. c. Download Sensor Graph (with LED controller) application and install on your phone. If you know Android Programming you can download the Android source code also. You can also get the original Amarino source code. The original source code has the Sensor Graph interface only (which means… there is no LED controller slider on the application). 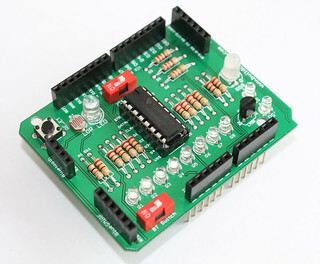 e. Stack the Amarino shield over your Arduino and your Bluetooth adapter over the correct female header on the shield. The shield supports 3 types of Bluetooth adapters. Please check here to know which adapters are supported. f. Keep the Bluetooth function of your phone alive, pair it up with the Bluetooth adapter using the pairing code: 1234 and note down the MAC ID of your Bluetooth adapter and type it on the text box of your Sensor Graph (with LED controller) application. g. Connect to the Bluetooth adapter with your application and use the Sensor Graph (with LED controller) application to operate the 5mm white LED with PWM signals and see the graph on the application interface. The LED and LDR have been kept together so that LED light falls properly on the LDR and you can see the light sensor response clearly on the graph. If your room is highly illuminated, you can put a piece of paper for better results. The paper will block ambient light falling on the LDR. i want to make a quadcopter with an ardruino board. i want to control it using my android.is the amarino tool kit useful for this purpose ?